The auditorium is available for public meetings on Wednesdays. Registration for Summer Activities begins Saturday, May 14 at 10 am. View the Summer Catalog and register online at www.sfreconline.org or stop by the Rec Center office to do so in person. Upper Noe is hosting seven one-week-long basketball camps (Mon – Fri, 9 -1) from June 6 to August 5. Early sessions are filling up but space is still available to join in the fun this summer. Register today. Adult Karaoke class is offered in the summer but does not appear in the Summer Catalog. Same day & time, Fridays 6:30 – 8:30 pm beginning June 10. Drop in and sing. New Zumba Class – Thursdays 10:30 – 11:30 am. There can be no congregating in the lobby during summer camp hours, 9 am to 1 pm Monday – Friday beginning June 8. Nannies and children cannot nap in the lobby during camp hours. Sorry for any inconvenience but Rec Center staff have no flexibility on this rule. Rec Center hours of operation now include Mondays from 9 am – 5 pm beginning June 6 through August 19th. Volunteers, get your gloves and your gardening game on this Saturday, May 14 from 9 am to noon. Joan invites amateur gardeners of all ages to come and help beautify our park. On the Sanchez Street side of the gym, we have rhododendrons blooming in pink and red. They were a gift from the 1700 block of Sanchez Street. We have yet four more plants for that area but we need help getting them into the ground. Please come for just 30 minutes and one plant will have a home. We also have more freshly painted birdhouses to put up. We hope to see you there on the 14th — do not forget – water, shovels, and gloves. We are happy to announce that Alvin Torres has returned to Upper Noe permanently. 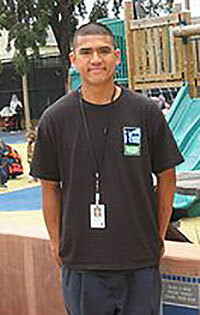 After almost a year away pursuing other career options, Alvin accepted a permanent position with Rec & Park. The full-time position of facility assistant is something we have been hoping to add at Upper Noe for years now to bring more stability and versatility to our staff. Facilities Coordinator Cheryl Woltjen is happy to have the office and activities fully supported. Alvin has been a responsible member of the Upper Noe team for years and we are thrilled not only to have him back but also to know that he will be with Rec & Park for the long-term. Welcome aboard Alvin. Free for boys and girls ages 6 – 17. Regional competition for this all-city basketball tournament happens at Upper Noe on June 24. One boy’s team and one girl’s team from each age division will advance to the finals at Kezar Pavilion on July 9. Sign up before June 17 by phone or in person at the Upper Noe office, 415 970-8061. Help shape up the grounds for summer. 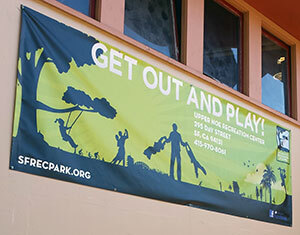 Help plan events and shape activities at Upper Noe.